When we were kids we used to tag along with my dad to visit his Muslim colleagues during Hari Raya (the Muslim New Year). My dad's colleagues would have "open house" during the two days of the Muslim New Year. "Open House" is a local custom whereby you literally open your house for friends and relatives to visit you during the celebrations. During such festivities, you would visit and at the same time partake of either a meal which could be snacks or even lunch. I remember we loved going to a particular "open house" as my dad's collegue's wife bakes the most amazing Kuih Bakar Pandan. The cake was soft, rich with coconut flavour and had the constitency of very thick kaya (coconut jam). It was so, so good that we would eat at least two piece per person. Unfortunately when his wife passed on, no one else seemed able to replicate the recipe. 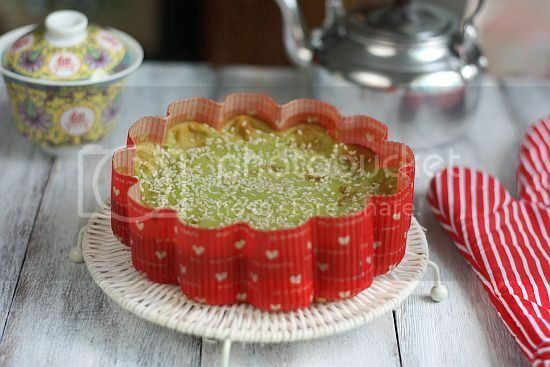 So can you imagine my excitment when I came across this recipe in Zurin of Cherry On A Cake's blog. Her pictures reminded so much of the Kuih Bakar I used to love when I was a kid. And the mere sight of her pictures made me want to try out the recipe as well. Coincidentally I also realized that I had the same flower paper cake mold as Zurin's. I had bought a few packs from Daiso a few months back and had used some for previous bakes. 3) Into a blender add 50ml water and the pandan leaves. Blend until the leaves become a pulp. Remove and strain the liquid through a sieve. Squeeze the pulp to extract all the juice. Pour the strained pandan juce into the coconut cream mix and keep aside. 4) Sift flour, salt and all spice. 5) Beat eggs and sugar together with a whisk until well combined (about half a minute). Do not over beat. Add the coconut cream and pandan mixture and stir to combine. 6) Add the sifted flour mix and using the whisk fold in the flour mix into the mixture until there are no lumps left. Strain the batter using a sieve to remove any lumps. 7) Add the butter into the cake pan. Place the pan into the oven for about 3 - 5 minutes until the butter has melted and starts to brown around the edges. Remove the pan from the oven and swirl the butter around to coat the pan's sides. 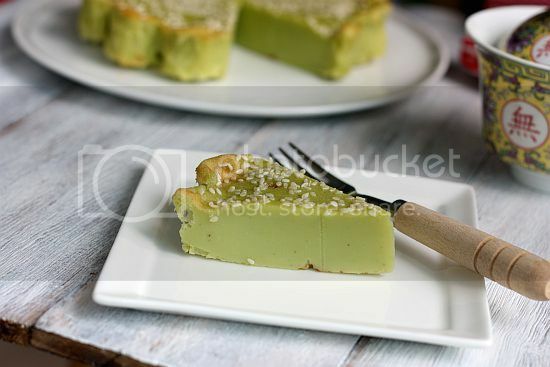 8) Then pour the pandan batter into the pan and bake for about 10 minutes. Remove the pan from the oven and sprinkle the sesame seeds on top of the cake. Continue baking for a total of about 35 to 40 minutes or until the centre feels firm and is not wobbly when gently pressed and the edges are a light golden brown and crusty. Allow to cool completely before cutting into wedges and serving. Your mould is so pretty. I am sure my hubby will drool on this kueh if I show this to him. Can he self invite? 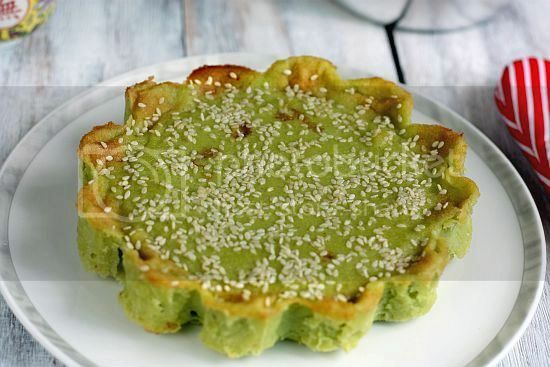 I've always wanted to try pandan, but I never knew what to do with it! Now, I have a recipe to try. This looks so delicious! Your Kuih Bakar looks so good. 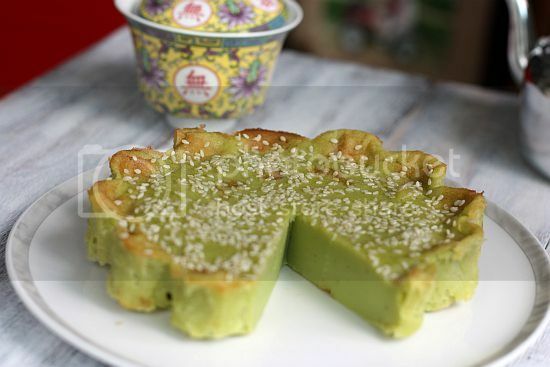 I don't know what is pandan or how it tastes but the cake looks gorgeous!Love the green colour! 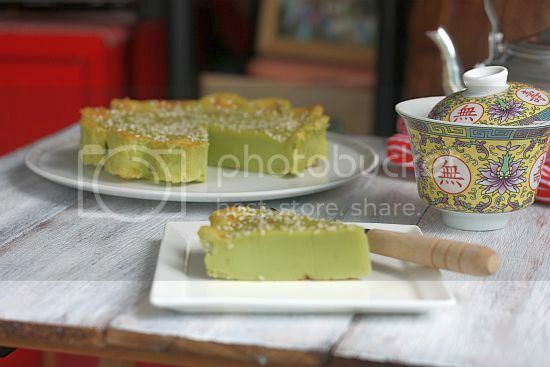 wow the kuih looks marvelous! Your Kueh Bakar looks really good! Really tempting me to try it out myself. :) Love the red and green color combo! Very Xmas mood even though its a Malay kueh, heehee! Lovely, lovely, lovely! Loved the colour and the texture of your dish...So happy to visit your blog. You have great recipes!! The texture looks lovely!! and the mold is cute too!! Hi all, thanks for dropping by. Hi Edith, haha .. of course he can self-invite. Better still next time I make one extra for you. Hi Tigerfish, yes, it is not a cake crumb texture. It's texture is a cross between thick coconut jam and jelly. Hi Sneige, I think you may have a hard time trying to find pandan. It is actually a leaf. Alternative would be to substitute with pandan paste that is in a bottle. I have this Kuih Bakar in the oven right now. I'm so excited that I have found your recipe. I will blog it as soon as I can and will credit your post on a link within mine. Thanks so much for sharing this recipe. hi. I wanted to ask, what is the all spice you are saying? I am currently in aussie..so i m not really sure what spice are you talking abt. isnt mixed spices? Wow I really missed this kuih bakar pandan. Old skool:) would luv to try out this recipe. the red paper flower mould is gorgeous. Where did you get it? This means that you literally get rid of fat by eating coconut fats (in addition to coconut milk, coconut cream and coconut oil). These 3 studies from major medicinal magazines are sure to turn the traditional nutrition world upside down!